Do you guys remember when the last episode for the year of a TV series didn’t have a term? Like, when did networks decide that the phrase “Winter Finale” was a thing? Definitely in the past couple of years, right? So dramatic. But as the Winter Finale of your fave shows roll out over this month, you’ll obviously need something to bide your time and avoid your fam during the stressful parts of the holiday season. Like last year, I’ve created a hopefully helpful guide to lead you in the right direction when it comes to preoccupying yourself over the next few weeks! Happy watching! Just like we fell in love with Cristin Milioti on How I Met Your Mother and she was promptly taken away, as is the fate of Cristin on the sitcom A to Z. The Lord giveth and NBC taketh away. Cristin Milioti deserves better than this. She’s a great actress who is perfect in the romcom role. In fact, everyone on this show is great. Ben Feldman – oh how I swoon for Ben Feldman (The Mindy Project Ben, not Mad Men Ben,obvs) – is perfect as the A (Andrew) to Cristin’s Z (Zelda). Like HIMYM, the show takes a different kind of approach in telling their love story, since we’re told from the pilot that they stay together for 8 months, 3 weeks and 29 days – those aren’t the exact numbers, but you get the picture. They’re so cute together that you wonder how and why it ends. I guess we’ll never be able to find out since NBC hasn’t ordered more than the 13 episode order. Nonetheless, you should catch up with A, Z, and their best friends, who provide that balance needed for an ensemble comedy. I’m not really a sports person, so I was initially turned off to Friday Night Lights because it looked like a football show. And that’s what its ‘downfall’ was. NBC didn’t really know how to market the show because there really hadn’t been anything like it before. Ultimately, it’s a drama about the tight-knit community in small town Texas, and football just happens to play another character in the show. That’s what Kingdom is. TBH, I only started watching it because of Matt Lauria and Nick Jonas are in it, but this gritty new series set in the MMA world is about the relationships between family, friends, and lovers. While there’s a fair share of fighting and blood and sweat, you’ll come to find yourself hooked on wanting to see what’s next for each of the characters. In addition, Kingdom has three actors from the Jason Katims world – Jonathan Tucker (Parenthood), Matt Lauria (Parenthood/FNL) and Kiele Sanchez (Matt Saracen’s wife IRL). Like you and the rest of America, I was turned off by the title of John Cho and Karen Gillan’s new sitcom, Selfie. It initially came off as this social media/internet/daft show that should’ve been titled #SELFIE, but turns out, it’s not. While social media does play a role in the show, as the season progresses, you’ll find that those two up there are at the heart of it. It’s actually a take on My Fair Lady/Pygmalion, in which John Cho plays “Henry”, who tries to class up Karen’s “Eliza”. Their dynamic reminds me a little of Danny and Mindy, where Danny’s kind of curmudgeonly and a no nonsense kind of guy, whereas Mindy is still smart yet flitty, into pop culture and clothes and the latest Cosmo. Mindy and Danny’s relationship works in an opposites attract kind of way, and so does Henry and Eliza’s. We’re at the point where there’s an inkling of a romance going on between them, but with ABC deciding to cancel it (BOOOOO) and Hulu picking it up (YAYY) who knows what we’ll get to seen and when we get to see it. All I’m saying is ignore the title and just watch the damn show. Sometimes I decide to watch a show based purely who’s on it, but then am delightfully surprised when the show turns out to be really good. Enter Joshua Jackson. Loyal readers may recall my journey through watching Dawson’s Creek for the first time earlier this year, and I was Team Pacey all the way (if you’re Team Dawson WHO EVEN ARE YOU). Like a fine wine or Leonardo DiCaprio, Joshua Jackson only gets better with age. In The Affair, he is hot as ever, and as Vulture pointed out earlier this week, he’s basically Pacey as a cowboy. But the storytelling is one of a kind in The Affair, and it’s what lured me in from the pilot. As stated in the title, there is an Affair – with a capital A – going on between Noah (The Wire’s Dominic West) and Alison (Luther’s Ruth Wilson). Noah’s married to WASPy Maura Tierney, while Alison is married to Pacey Witter. Set in the summer in Montauk, Long Island, Noah and Alison meet and start to have this affair. We also find out there’s a murder early in the season, and both Noah and Alison are being interrogated months after their summer affair. But the twist: the show is split into two parts, one from Noah’s point of view and one from Alison’s. Needless to say they have different versions of the truth. But also, Pacey on a horse. 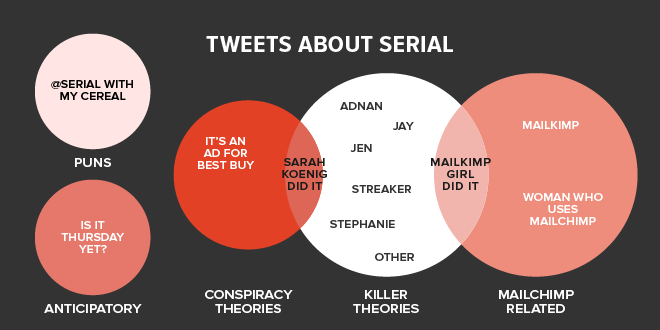 I HAVE A LOT OF THOUGHTS ON SERIAL, AND I’M GOING TO SAVE IT FOR THE DAY SEASON ONE ENDS. But for now, if you don’t listen to Serial, get on it. I lit’rally gave in to peer pressure and started listening to it over Thanksgiving because everyone kept talking about it and I had total FOMO. I’ll tell you that I’m not usually a fan of crime related entertainment – I’ve never been into the Law & Orders or CSIs or Criminal Minds of the world. But this is a horse of a different color. Serial is one podcaster/reporter’s journey into delving deep deep deep into a real murder case of a teen and her attempts to solve it. Is it really the guy sentenced to life behind bars or is it someone else? WE DON’T KNOW. This isn’t really a spoiler, but there’s a part, I think in episode 5 of Serial, where Sarah, the ‘host’ of the podcast, consults a lawyer who deals with a lot of Innocence cases – where they believe person in jail didn’t commit the crime and she tries to prove they didn’t do it. This lawyer is super interested in the murder case featured in Serial, and even has a team of her law students help her investigate. Sound familiar? Because that’s basically the plot of How to Get Away with Murder. Viola Davis is a high-power attorney who can quite literally get anyone off the hook for any crime, and she has a crack team of students helping her. While HTGAWM is much more dramatic than Serial, both have the same amount of suspense and theorizing that will make you go insane. In a good way. Thanks!! I love that there’s another Selfie fan out there! It gets better with each episode!